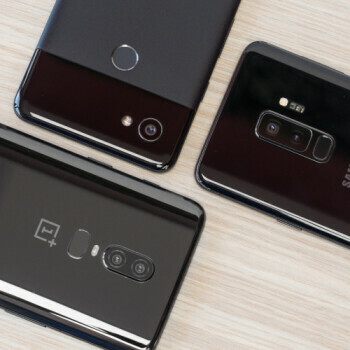 OnePlus phones have traditionally impressed with great performance, but camera quality has never been quite up to par with the otherwise great hardware powering OnePlus phones. This held especially true for the 5 and 5T, which never really managed to impress us with their camera game. However, things seem to be changing for the better with the OnePlus 6. With the OnePlus 6, you get a dual camera setup that combines a 16MP main camera with a 20MP secondary shooter. The main snapper has a 19% larger sensor than last year’s model and an f/1.7 lens, as well as OIS. The secondary camera is not stabilized and doesn’t have a longer focal length, but it’s to pull out more details in darker scenes and for shallow depth of field simulation (a.k.a the background blur used in portrait mode). Things have considerably improved over the OnePlus 5 and 5T, there’s no question about it, and this could even very well be the best camera ever on a OnePlus phone. But is it good enough to go head-to-head with the best of the best? This is the OnePlus 6 vs the Google Pixel 2 XL, Galaxy S9+, and the iPhone X. Right off the bat, the OnePlus 6 performs remarkably similar to the Galaxy S9+ in this scene. Slight differences in color temperature aside, both shots are bright, vibrant, with a somewhat song greenish tint to them. At 16MP, the OP6 manages to be arguably a bit sharper, though this is also a result of the new image processing approach, which is decidedly Samsung-like in the way it handles colors and saturation. The Pixel 2 XL and iPhone X seem unbothered by the strong sunlight, seeping in through the lush trees, and manage to produce images without as much green tinting as the other two. They may look warm to your eyes, but are actually better representations of the scene (look at the tree trunk and how green it appears on both the OnePlus 6 and Galaxy S9+ photos). Granted, the Pixel manages to outdo the iPhone by pulling better detail from the shadows. This scene is easier, with a somewhat detailed subject against a simple background. All four do a good job here, with the Galaxy S9+ perhaps having a bit of an edge with its completely noise-free reproduction of the scene. If you really zoom in, you'll notice all the others, including the Pixel 2 XL, have a bit of noise in the sky. That said, the OnePlus 6 fares just as well as the Pixel 2 and the iPhone X. It's interesting to note that the OP6 pulls the up the shadows on the left side of the building in a Galaxy-like fashion. Seems like the company has been taking notes from its rivals and there's nothing wrong with that! This scene even further highlights the similarities between the OnePlus 6 and the Galaxy S9+. Even the lens flare is remarkably similar! The OnePlus 6, however, produces an image that's slightly cooler in tone, with a noticeable blue tint in the shadows. The detail is also marginally better in the Galaxy S9+ shot, marginally being the key word here. Here, all four phones fare in a very, very similar way. The iPhone X is surprisingly brighter, while the other three produce remarkably similar results. Zooming in, we can see that the OnePlus 6 uses an HDR technique comparable to that of the Pixel 2 XL, resolving more detail in the shadows and foreground. As far as detail goes, all phones are pretty much on par, with the iPhone X lagging behind a bit with murkier details in the shadows. Another brightly-lit scene that's rich in detail. And again, remarkably similar results. It's great to see the OnePlus 6 going head-to-head with the Galaxy S9+, the Pixel 2 XL, and the iPhone X and managing to hold its own against them. 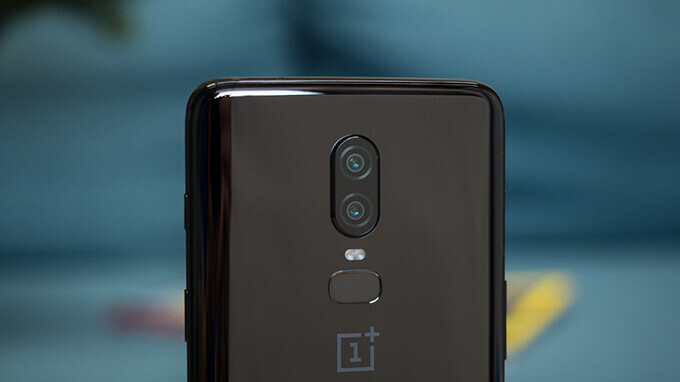 We'll see how it does in low-light, which is where the big guys are focusing their efforts now, but during the day, the OnePlus 6 is pretty much on par with the competition. Yes, color and white balance are not always spot-on, but people love Samsung-style image processing, and sharpness is quite good on the OnePlus 6. If it also had a manual mode to match Samsung's, so you could tune the photos to your liking, that would have been great. 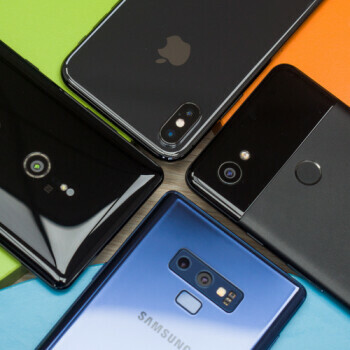 Leapfrogging the competition with meaningful smartphone camera innovations and improvements is becoming exceedingly difficult. And so is doing camera comparisons. 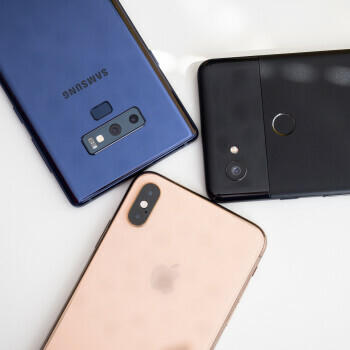 The major companies have refined their respective approaches to smartphone photography so much over the last couple of years, that both the camera hardware and software powering their products have reached a plateau of sorts. Everyone’s gotten so good at daytime photography, that one of the major differentiating factors has become low-light performance. And even then, the gap is ever-narrowing. Speaking of that, we’ll have a night-time shootout soon, so don’t forget to tune in for that. The OnePlus 6 is an obvious, and welcome, step up from the 5 and 5T. OnePlus has settled on an image processing approach that’s very Samsung-flavored in the way it renders colors in brightly-lit scenes. Some people may dislike this, but there are tons of others who love sharper, more vivid imagery and OnePlus seems to have taken notice. All in all, the camera on the OnePlus 6 is not quite as well rounded as the phone it comes attached on, but much like it, it manages to offer commendable performance at a substantially lower price. This is no doubt the best camera OnePlus ever made and one that you won't regret putting in your pocket. Where is the lowlight pics? Where is P20 Pro????? 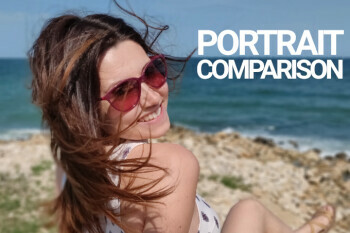 Just remove the iPhone x from comparison and include P20 pro instead. "Beauty is in the eye of the beholder" We need a blind camera test to resolve this matter. You believe in blind camera comparison of iPhone Arena? What guarantee you have that they bring the best shot from any scene from any phone? You can decrease the quality of a photo with the way you take it - more shake, movement etc. I do not believe in iPhone Arena camera comparisons. I bought to my daughter P20 Pro 6 days ago. All pictures are amazing, comparing to Galaxy s9+ and low light is unbeatable. S9+ is better only in video in 4k, P.S. The ZOOM of P20 Pro is also amazing. Even in low light it works well - tested on concert at evening. Blind test = ppl vote for beauty, not quality Pics that show warm colors and more contrast/brightness than reality always earn more votes. No matter how fake they look. It doesn't matter. That means that the iPhone is delivering pictures that our eyes love the most. No, it means it's delivering pictures that the masses like. I disagreed with almost every pick in the blind test, but I just value different aspects from my photos than people who just point and shoot and post. To each their own or course. That's what I said. It definitely doesn't please everyone, but it does the job for the majority of us. Lol it sure didn’t bother you when Samsung was winning blind contests due to high contrast and saturation. Why not remove the S9 or the Pixel 2? Better yet, why not keep all the phones above and add the P20 Pro to the mix? The X must be in this test whether you like it or not, as it's the best representative for the iOS platform and definitely a top 3 cameraphone. With only one challenging shot and even then PA cut out the sunlight so the iPhone unibrow could balance the dynamic range. Cry cry cry. That's all i just read. LOL. I cannot see a $300+ difference between the OP6 camera and the others. All outputs are very very similar. With OIS and 1.22um pixels I can't see why would you pay more for the other phones if camera is your main concern. Better low-light ? Let's wait and see ! There are plenty of videos testing both cameras in low light, and the OP6 fails miserably. It fails to focus in low light conditions. Supersaf's review is an example in case you want to see it yourself. It gets spanked by the Galaxy S9 in Supersaf's camera test, especially when it comes to low light. The Galaxy S9 is very hard to beat at low light. Please also note that this is the first version of firmware for the new OP6 camera hardware. I would wait a month or so for a couple of camera updates in order to draw a conclusion. People didn't wait to draw a conclusion on the Galaxy S9's camera hardware? People had a conclusion after the first day of the release, so why should this be any different? They shouldn't give consumers an unfinished product, it's simply not okay. It was already beaten badly by Huawei P20 Pro. That's because you're comparing the OP6 to last year's flagships. The pixel 3 and the iPhone XI are yet to come out. Also, these differences get greater once you go to low light imagery, since the OP6(and the iPhone X) can't keep up with even Pixel 2, let alone the S9. 1.4um pixels are a lot bigger than 1.22um (32% bigger) and that's a lot of ground to cover. 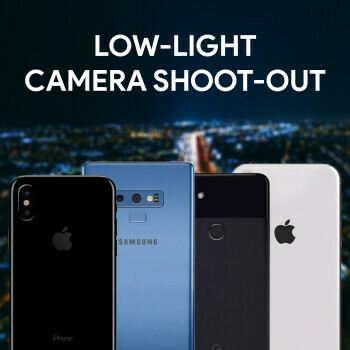 Samsung further extends its lead by using a bigger aperture as well, which again gives it a 28.5% lead over even the pixel 2 XL. Not to mention that Google's and Samsung's algorithms and focusing systems are also a lot better. OP6 seems to have issues focusing in certain scenarios. Don't get me wrong. The OP6 is an excellent phone. And the camera will be good enough for most of the users. But in camera, you get what you pay for even with this one. At least OP6 doesn't embarrass itself like 5 did. The Pixel 3 & iPhone XI are a good 4-5 months away. You can only compare against what is already available. Agree with you. I've got my RX100 for real lowlight and slowmo when I need it, OP6 is an actual contender with the big dogs in camera department. If they patch some better low light color profiles, I think they'd have a real winner. Pixel is still the king. even the pixel 1 beats the others.